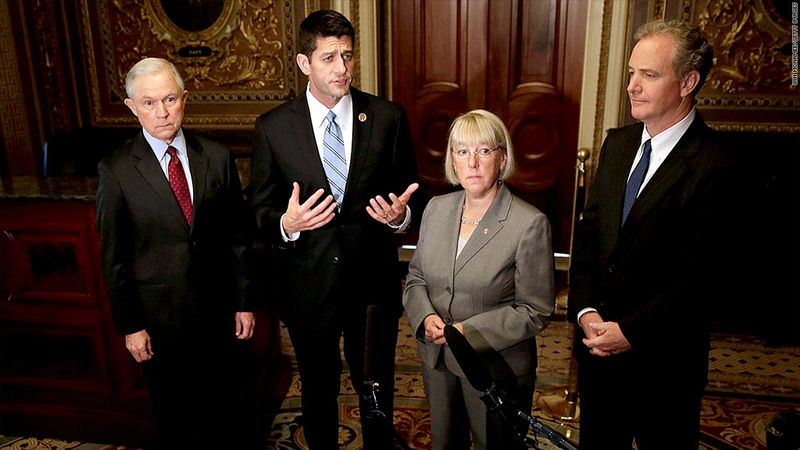 Republicans Jeff Sessions and Paul Ryan and Democrats Patty Murray and Chris Van Hollen are leading a bipartisan group of lawmakers who are trying to forge a budget agreement to fund the government for 2014. Forget a grand bargain. Most people will be relieved if Congress can just agree on funding for fiscal year 2014, which started three weeks ago. Lawmakers have until mid-January, when the current round of temporary government funding expires, to figure it out. If they don't, the country could be at risk of yet another shutdown. And two numbers could scuttle chances to strike a deal: $967 billion and $1.058 trillion. Behind both is the fate of the roundly criticized "sequester" or automatic budget cuts, the first round of which took effect in March. $967 billion: That is the funding level for defense and non-defense programs that House Republicans have called for. It also represents where funding would be after the second round of cuts from the sequester takes effect in 2014. But the Republicans would allocate that money differently than called for under law, with cuts leaning more heavily on non-defense programs. $1.058 trillion: That is what Senate Democrats have proposed. It is where spending would be if the sequester were canceled for 2014. The Democrats have proposed making up for those savings over time, through tax increases and other spending cuts. So the parties should just split the difference, right? Maybe, but even that could be tough. The going assumption is that lawmakers will only end up replacing a portion of the sequester. But then the questions become: How much of the sequester will be replaced? How will it be paid for? And will the savings be realized over time or will they be immediate? 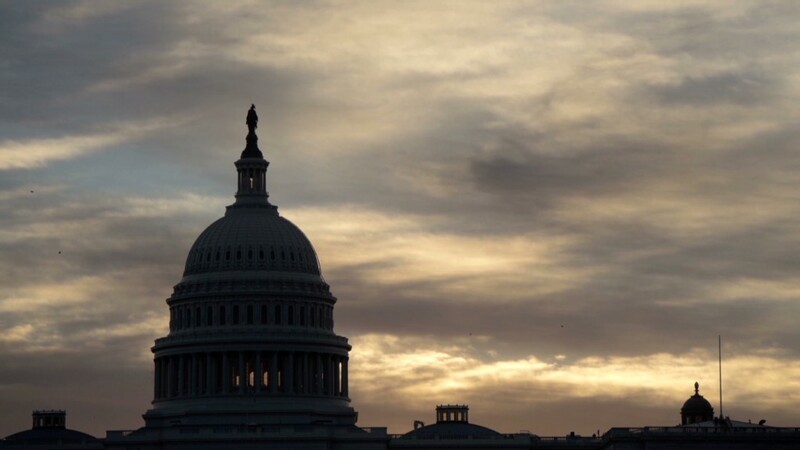 At the moment, the government is being funded temporarily through January 15 at an annualized amount of $986 billion, which represents 2013 spending levels. If nothing changes, the sequester calls for another automatic cut of about $20 billion soon after. That's unappealing to Republicans because that second round of cuts would hit defense most heavily. It's also unappealing to Democrats because allowing that second round of cuts to occur all but codifies the sequester as a fact of life, said Marc Goldwein, senior policy director at the Committee for a Responsible Federal Budget. So they both have incentives to deal. Except the parties' respective positions have created what Keith Hennessey, former head of the National Economic Council under President George W. Bush, describes as a "fiscal Gordian knot." Here's what he means: If the sequester is to be replaced, the Republicans have proposed doing so by finding equivalent savings through entitlement cuts. That's a no-go for Democrats, who will only agree to entitlement cuts if they're matched with revenue increases. That, of course, is likely to elicit a big, fat "No!" from Republicans. "The sticking point will be revenue," Goldwein said. If they can't work that out, it's back to square one. Hennessey and his liberal sparring partner, economist Jared Bernstein, disagree about a lot. But in a New York Times "Room for Debate" blog they agree on this: Another shutdown should be off the table. If the budget conferees agree with them but still can't reach agreement on a 2014 budget, the country must then "slog along" -- as Bernstein puts it -- with yet another series of short-term funding bills and the opportunity to have this fight over and over and over again.